If you’re looking to give your machine a unique custom look then Rogue Off-Road has a solution for you with their one-of-a-kind mesh hoods and grills for UTVs. 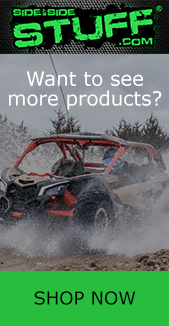 Not only will you get a sleek and aggressive look, Rogue Off-Road has designed these products specifically to let radiator heat extract quicker from your UTV. This allows your machine to run cooler while adding strength and durability over your factory hood and grill. These products are a 2-piece design; they’re made from laser-cut 14 gauge steel with a powder coated finish and are assembled using stainless steel bolts and nuts instead of rivets allowing the mesh to be exchangeable. Furthermore, the hood mounts securely using OEM hood locations. Installation is simple and straight-forward with no drilling or cutting required and all the necessary hardware is included. All Rogue Off-Road mesh hoods and grills are made in the USA and are backed by Rogue Off-Road’s lifetime warranty. At Side By Side Stuff, we offer Rogue Off-Road Hoods, Grilles, and Hood and Grill combos for a variety of machines with a variety of color options.